Standing at 5ft 6ins, weighing about 62kg (9st 7lb), Leonie Leaver has spent the last year weathering blows from blunted swords and axes. The cleaner from Perth likens the force to the knocks she used to take on the ice hockey rink – only now there is the unmistakable clang of metal on metal as she faces opponents clad in steel. 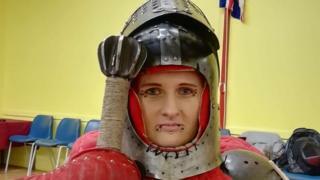 Leonie, 35, is the first woman in Scotland to compete in armoured medieval sword fighting – in other words, the country’s first female knight. It is a deceptively welcoming sport, she says, despite the aggression, weaponry and disproportion in numbers between the sexes. “I think many women are under the illusion that it’s a male-dominated sport, and it’s not really – all my guys have been brilliant,” she said. 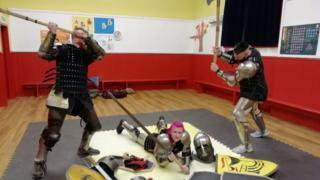 Her guys form the infantry of the Scottish Knight League – Scotland’s national team for medieval tournaments who train in groups across the country. Women do take part but usually in soft kits not metal armour. 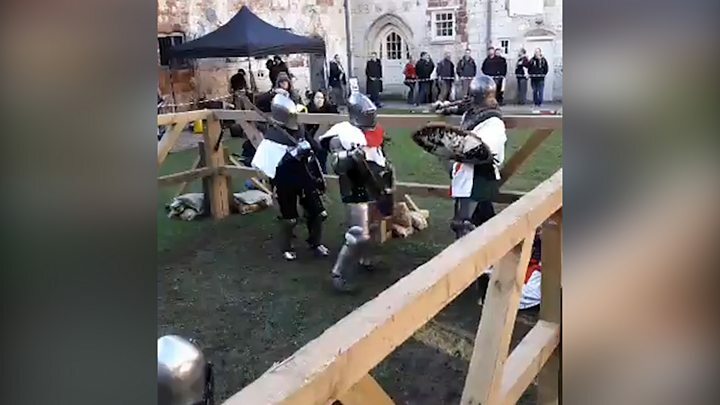 Leonie got hooked after watching warriors in action at the International Medieval Combat Federation (IMCF) World Championships at Scone Palace last year. Between work and caring for her seven-year-old daughter, Leonie has trained with the league ever since. “I’ve been treated as an equal straight away,” she said. 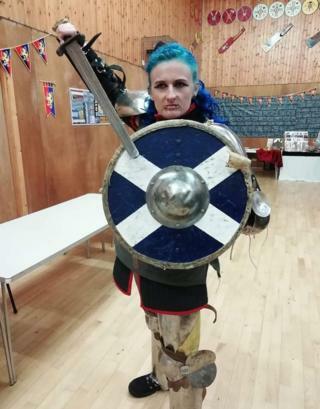 “There are other women in Scot who participate but not competing in armour – they do it in soft kit. “I started off training in soft kit, but all that was in mind was what I saw – these wonderful strong warriors giving it their all – and I wanted to push to get into that. 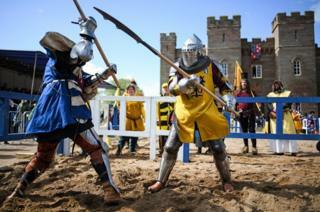 To beat an opponent in medieval combat, competitors have to strike clean blows on their armour, earning up to five points in each match – one point for every wallop. The sport has been described as “safer than rugby” in the past, despite the sometimes painful and occasionally bloody injuries. The key to staying safe is the robust re-enactment armour which Leonie initially borrowed from her fellow team mates but she soon wanted her own kit. She worked at two jobs to purchase the £1,600 armour and £300 helmet. “I had to buy my own armour, she said. “I used to borrow it off the boys, which was wonderfully kind, but obviously being female you’ve got a much smaller frame. “I used to do a cleaning job and had a bar job in the evening as well as looking after my daughter. I did that for three months. Throughout her adult life Leonie has been a keen sportswoman, regularly playing ice hockey and rugby – but nothing has quite given her the thrill of wielding a sword. It has been a boost that helped her overcome a dip in mental health over difficult winter months. Leonie added: “My daughter Cali comes to training with me. She loves it and the boys are brilliant with her. “They put her in a soft kit with a shield and sword, have a bash about and teach her how to strike. We’re all like brothers and sisters. Leonie’s new-found strength was put to good use last weekend when she competed for the first time at the Call to Arms event at Blackfriars Friary in Gloucester. 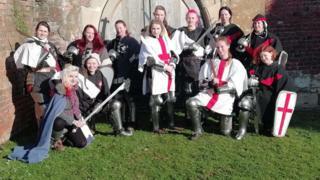 She clashed her way to victory during one group fight with fellow warrior women from across the UK. She added: “I’ve had so many messages of support from the guys in my team – saying ‘you rock girl, you’re badass’. Quality giant Weight Loss and Diet PLR multi-pack with eBooks, articles, infographics and videos.